Figure 4.2. Clustering of the Postsynaptic Adhesion Molecule, neuroligin-1 (NLGI), by PSD-95 in COS Cells. COS cells were transfected with either (A) HA-tagged NLG1 (HA-NLG1) alone, or with (B) HA-NLG1 and PSD-95 GFP. When co-expressed, these two proteins co-localize into large clusters or patches (white arrow heads). Overexpression studies in neurons show that PSD-95 accelerates clustering of several proteins, including neuroligin-1 and the glutamate receptor subunit GluR1 (Figure 4.3). Co-expression of neuroligin-1 and PSD-95 also results in an increase in the clustering of several presynaptic proteins, including synaptophysin. Taken together, these findings indicate that clustering of postsynaptic proteins controls the size and function of the PSD and presynaptic terminals. Figure 4.3. Enhanced Expression of Neuroligin-1 and PSD-95 in Hippocampal Neurons Results in the Clustering of both Pre- and Postsynaptic Proteins. Hippocampal neurons transfected with (A) HA-tagged neuroligin-1 (HA-NLG1) alone or with (B,C) GFP-tagged PSD-95 (PSD-95 GFp). (A) Expression of HA-NLG1 enhances the number of presynaptic sites positive for synaptophysin (Syn). (B,C) Co-expression of HA-NLG1 with PSD-95 results in an increase in the size of clusters of (B) synaptophysin and (C) the postsynaptic proteins, HA-NLG1, and the glutamate receptor subunit GluR1. Note the relative increase in the size of HA-NLG1 clusters in cells expressing HA-NLG1 and PSD-95 when compared to cells transfected with HA-NLG1 alone. 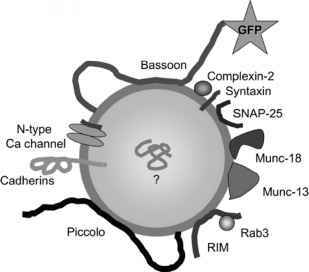 Another important contributor to protein clustering is the presence of filamentous actin (F-actin) at the synapse. F-actin acts as an anchor that stabilizes multiple protein complexes within the PSD. For instance, coupling to actin is thought to assemble a complex containing PSD-95, GKAP (guanylate kinase-associated protein), shank, and cortactin11. Cytoskeletal components of the PSD are also thought to trap transmembrane proteins and signaling molecules in domains specified by adhesion molecules12,13. This retention concentrates receptors and effectors in a region directly opposed to the presynaptic active zone, allowing for rapid signal transduction between the closely associated proteins and preventing lateral diffusion13. Another mechanism thought to contribute to retention of the clustered receptors at the synapse is the formation of puncta adherentia, small junctions formed by actin cytoskeleton in conjunction with adhesion molecules. These junctions are characterized by dense thickenings on both sides of the junction and an absence of synaptic vesicles. Puncta adherentia stabilize connections between adjacent cells at sites lateral to the synapse14. Thus, cytoskeletal elements are important for stabilizing cell junctions, assembly of protein complexes, and maintaining their clustering at the PSD and in turn optimize their function at the synapse.